A couple of days ago, I got an email from a student named Andrew that really got me thinking. Your question comes at a perfect time and illuminates a concern I’ve had for a lot of our guys for a while now. I worry that you may be getting lost in the weeds a little. I read the EMG study you are referring to which was actually more of a data dump of some preliminary information from what looks to be an interesting larger project. Here is a landmark study I first read way back in 1999 that identified the importance of GRF in both legs. Of course GRF in the lead and trail legs are important. But simply creating more GRF through strength training and drill work by itself isn’t enough to improve performance. There are so many variables involved regarding synergy, timing, co-contraction, stabilization and synchronization of the kinetic chain that we will never know all the answers. When an athlete, coach, or instructor gets caught searching for the perfect amount of (fill in the blank with the hot topic of the day), the questions and the kinesthetic confusion can be infinite. How much GRF do you need? What is the optimum rate of force development? How much glute load is enough? What is the perfect humerus to forearm angle? How high should your humerus be compared to your shoulder? How fast do you need to move? Is the speed of rotation of the back hip important? If so, how fast is fast enough? What is the perfect balance in power of the internal and external rotators of the shoulders? What is the quantum coefficient of correlation between the maximum force permutation of the teres minor and the serratus anterior relative to the timing of the vernal equinox? Our evaluation process examines over 58 variables we use to establish broad safety guidelines and to customize training plans. The medical literature has identified several variables that might put athletes at risk for injury, and although no single factor or test has been shown to be a completely valid predictor of injury, our commitment to first “do no harm”, compels us to nudge our athletes inside those broad boundaries before we allow them to push for performance gains. Still, there are always going to be outliers. There will always be guys who perform outside of those borders who survive, and even thrive. On the other hand, there will be guys who appear to fall within those limits that will break. That’s because what we don’t know about the complex, dynamic system of the human body as it relates to throwing far outweighs what we do know. Nonetheless, it is our ethical responsibility to play the odds and work to get guys inside the known boundaries of safety before we start pushing. Inside of those parameters, there are countless ways to throw. Each pitcher presents with his own set of physical attributes, constraints, and intent-driven neurophysiologic habits that influence his throwing pattern. The human body is a complicated, dynamic organism, and throwing efficiently, powerfully, and accurately is a highly complex endeavor. 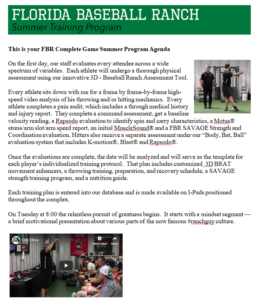 After adequate ramp up and preparation of connective tissue, we simply help the athlete formulate his goal/intent. We find innovative ways to apply varying stimuli. We use that information to provide feedback to guide the athlete toward more efficient self-organization. The type of feedback provided is critical. In motor learning there are 2 basic types of feedback: knowledge of performance (KP) and knowledge of results (KR). Knowledge of Performance is subjective. It makes value judgements about the quality of the movement. According to the motor learning literature, KP slows the rate of learning and inhibits performance. KP talks a lot about how the movement looked. Knowledge of results (KR) is objective and makes no value judgement as to the quality of the movement. It makes no consideration of how the movement looked. Did it hit the target? Did the dude with the bat in his hand go back to the dugout? I’m afraid that in our effort to “scientifically” collect and apply “data driven” training models, we are severely over-complicating things for our athtletes. How do we know how deep our glute load should be? How do we know how long the stride should be? 1) Did it hit the target? 2) What did the radar gun say? 4) Did the dude with the bat in his hand go back to the dugout? The highest performers in any sport execute their movements subconsciously without being able to verbalize them. For now you need to throw and let the answers to those 3/4 questions be your guide. As long as you’re inside the parameters of safety as we know them today, then let your infinitely intelligent body organize itself. Execute your throw, assess the result, and if you like the result, myelinate the ever-living dog out of it (if you don’t like the result, give it a blank stare and move on). Then do it again and again and again.